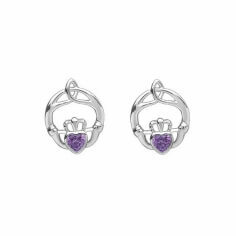 The February Claddagh birthstone ring is a very meaningful ring to wear as the Claddagh ring generally symbolizes friendship (hands), love (heart), and loyalty (crown). How the ring is worn also says a lot about the person wearing it. If the ring is on the left hand and points away from the wearer, they are engaged or married. If the ring is on the right hand and points away from the wearer, they are in a relationship, and if it is on the right hand and points to the wearer, it means they are single. 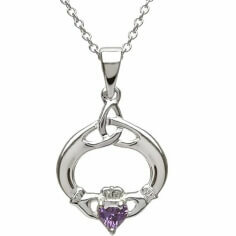 February's birthstone is an amethyst, and it symbolizes intuition, sincerity, and motivation. It was believed to strengthen relationships, and give the person wearing it courage. 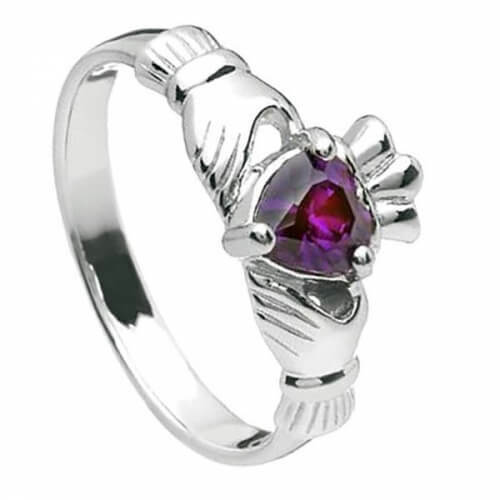 The color purple of the stone symbolizes healing, meditation, wisdom, and spirituality. This ring is available in Silver, 10K Gold, 14K Gold and 14K white Gold.